In a tomb in the Valley of the Kings, hieroglyphics teach us about ancient Egyptian life. On our trip through Egypt, we hit most major historical and architectural sites in Cairo, Alexandria and Luxor: the Pyramids of Giza, the new great library Biblioteka Alexandrina, the temples at Luxor and Karnak, and the tombs in the Valley of the Kings. Stunning and powerful, one and all. 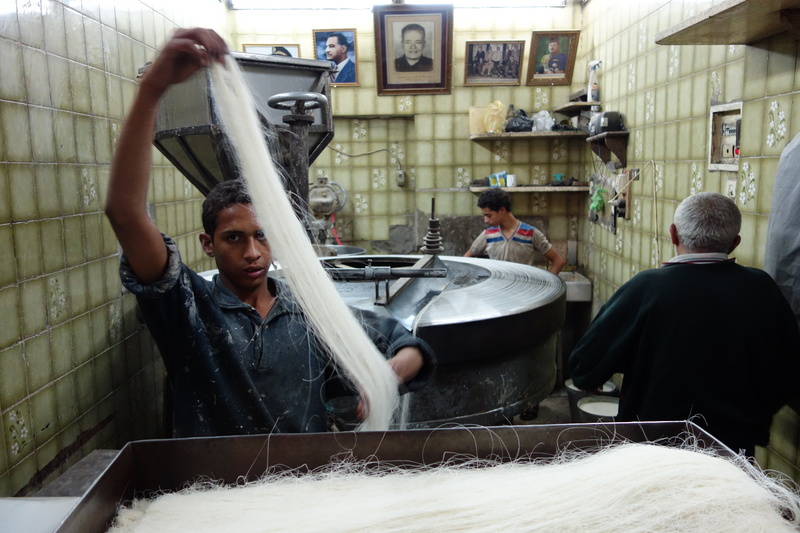 But equally fascinating to me was experiencing daily life with contemporary Egyptians. Wherever we went, we always made time to visit the local markets. Some were contained within a few narrow and dusty lanes, others seemed to course through every pot-holed street in an entire neighborhood. Some thrived in the morning, and many were busy all day and late into the night. Don’t bother picking the melon yourself. This friendly and gentle man will pick you the perfect one. Whatever you need, you can find. 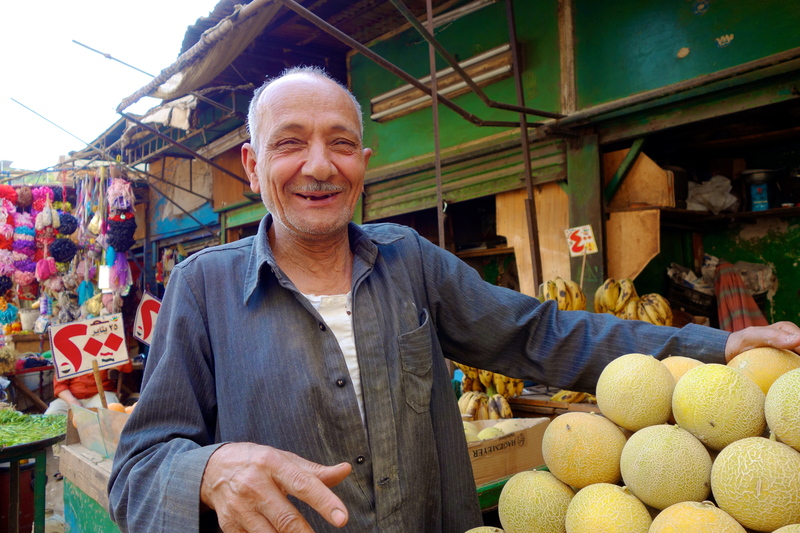 Huggable, overstuffed grandmas peddle the freshest tomatoes, eggplants, and mint while toothless old men with smiling eyes can pick out the best melons for you. Cigarettes are everywhere and locals know that ubiquitous packets of Kleenex come in handy since many non-residential bathrooms lack toilet paper. Knock-offs of Mickey Mouse shirts for little boys are as prevalent as frilly party dresses for little girls. 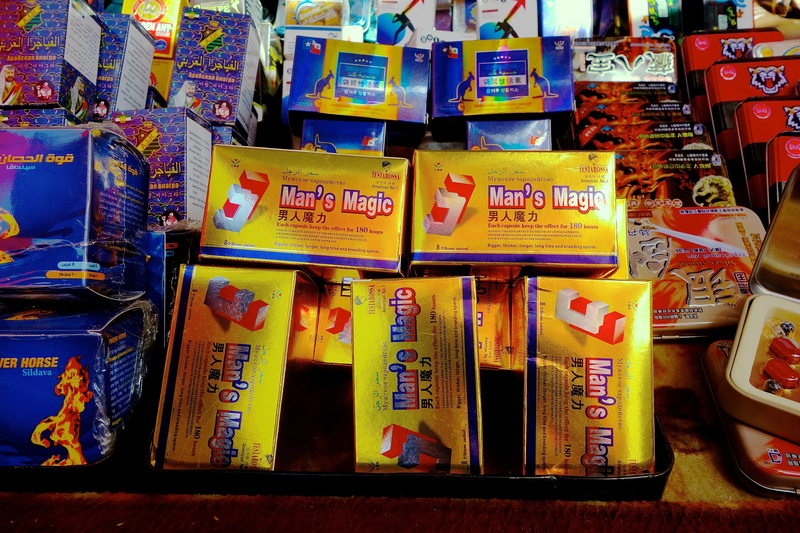 Man’s Magic and other Viagra-like supplements can be found in practically every other market stall…right next to conservative cover-up dresses for women. This wasn’t surprising. However, what was astonishing to me were the stalls and shops selling conservative cover-ups for women that were bookended by vendors selling racy lacy lingerie that actually made me blush or Viagra knock-offs like “Man’s Magic.” When I asked one of the vendors how business was going, he smiled and said, “I keep my family in a nice home and food on the table.” The Western World doesn’t have a monopoly on carnal desire, and clearly there’s enough in Egypt to keep plenty of people in business. Sanitary conditions not as high priority as in The States…but it seems to not be a problem here. 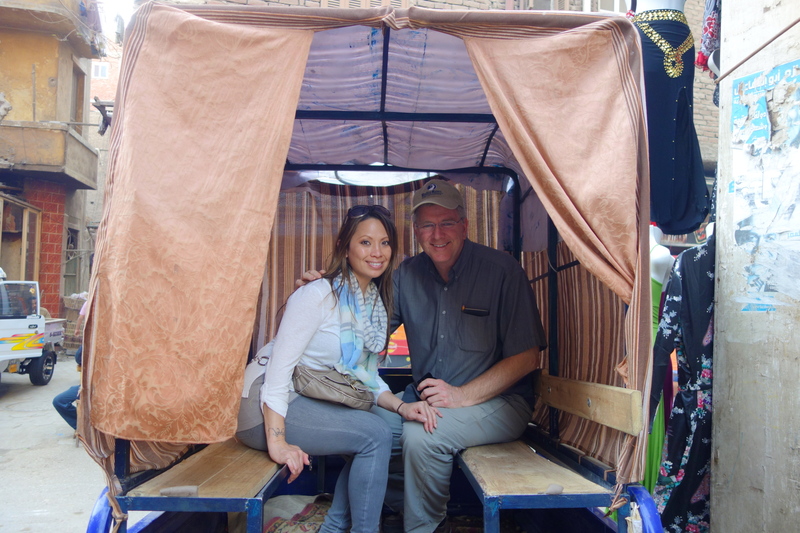 More often than not, Rick and I were the only tourists–certainly the only American tourists–roaming with the locals through the souks. While everything was elementally the same as any commercial area in the States (merchants eyeing potential shoppers, people looking for a bargain, a broad quality spectrum of products), for me, the unusual visual environment and even the products themselves kept my head on a swivel and my mind swirling. All kinds of questions popped into my head: Is it really safe to buy that unrefrigerated butchered meat, how come the kid selling falafel isn’t in school, why are there suddenly thirty people at this bakery, how does a merchant stay in business when there’s so much competition, are these mostly middleclass locals or is market shopping a common denominator? Bread like this has long been subsidized by the government, offering basic sustenance to those who can’t afford more than the basic. Having friends to guide us through the markets was helpful when we had general questions. 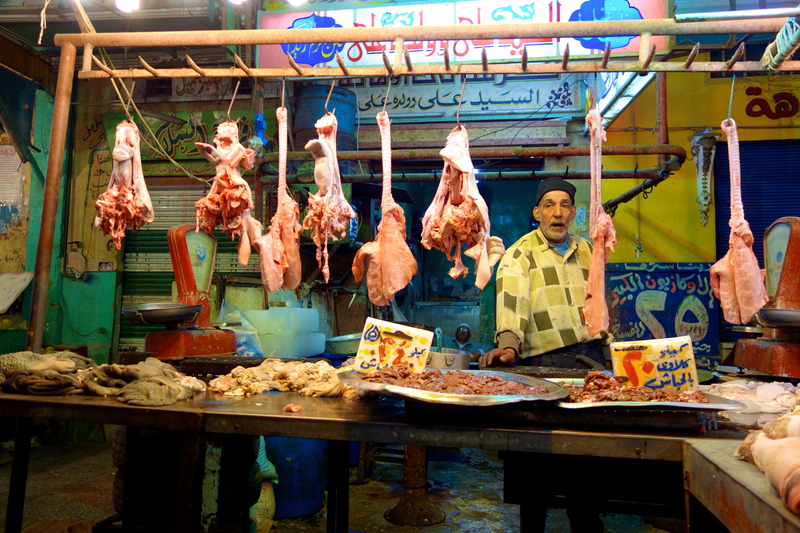 Yes, Egyptians are used to buying meat like this and don’t get ill. Although schooling is available for everyone, in some families, everyone needs to work in order for the family to function. There’s a particular type of bread that is subsidized heavily by the government. When bakers have a fresh batch ready, it’s typically lower income locals who descend like vultures to carry away their fair share. 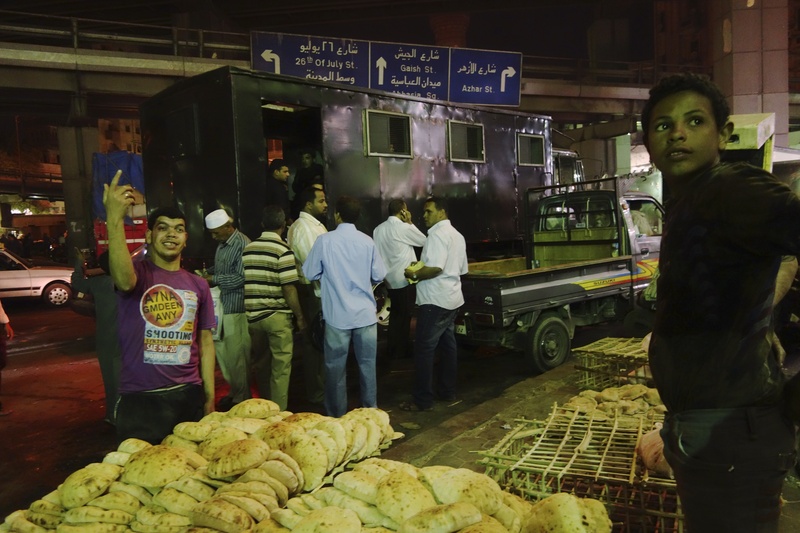 With around 40 percent of the Egyptian population living on $2-3 a day, recent attempts by the Morsi government to ration the bread has caused countrywide outrage. With shared poverty comes shared concern, so people “invest” their earnings in their community by supporting local merchants. It’s generally the lower- and middle-income earners who are the job makers and job sustainers. And while everyone’s shopped in neighborhood markets at some point in their lives, you’ll find that those who are better off tend to shop elsewhere. For them, coming to the market is a novelty. 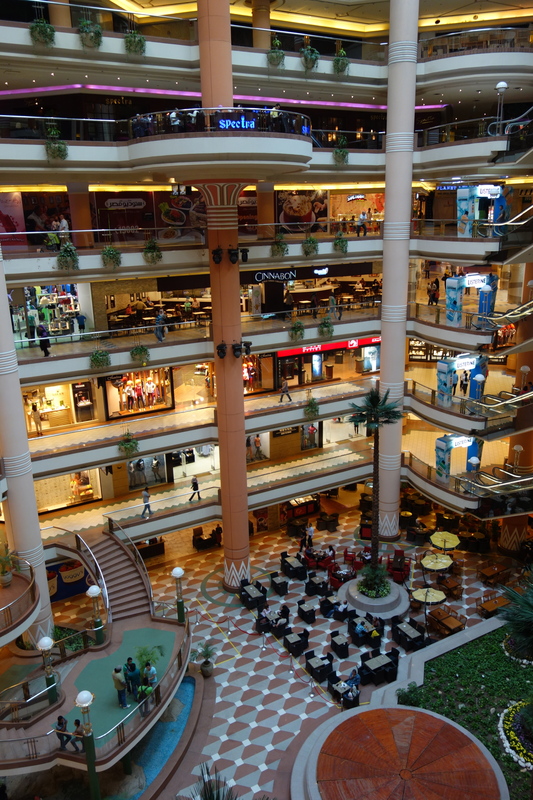 For more upscale shopping than a market street, Egyptians who can afford to shop at seven-story mega malls like City Stars. But even our friends aren’t necessarily experts on particular neighborhoods industries. That’s when the uninhibited traveler in me kicks in. If you let your guard down, curiosity can open doors and reveal cultural secrets that can shed a whole new light on what you don’t know and what you thought you knew. Well into the night, this young man and his family work tirelessly to make shredded wheat to be sold to bakers making delectable desserts. When strolling by a tiny store, illuminated by the sickly light of a florescent lamp, we saw a fibrous material being hoisted by a young man. We poked our heads in and learned that he and his brothers were making long, floss-like strands of shredded wheat, used in a traditional Egyptian dessert. A cylindrical machine went round and round, spinning out the edible tinsel, until there was enough for the boys to cut and transfer to a tray. The first young man offered us a sample. Brittle, with the slightest hint of sweetness, this freshly made shredded wheat was made in a 3-man factory, ready to be sold to a local baker to be transformed into sweet treats for countless neighbors. Ready for our ride through a market through the Muslim Quarter in Cairo. Wondering about public transportation, we learned that public buses are reliable and private buses are convenient but the drivers can be reckless. In neighborhoods with a labyrinth of slender streets, people have recently been using tuk tuks (think of the three-wheeled moto-cabs of India). Even more recently, some entrepreneurial wunderkinds have taken old motorcycle butcher wagons, strapped on a cloth cube for covering, and have started a transportation service. One Egyptian Pound will get you from one end of the neighborhood to the other. It’s cheap, it’s convenient, and it’s a hoot to ride in. Even for our pal Hammad, it was thrilling to zip through well-worn lanes, dodging grocers, grandmas in burkas, delivery boys, horse-drawn carts, and shoppers, trusting that our driver Ahmed would get us to our destination (check out the video footage I shot of our ride through the Muslim Quarter local market, check it out on Rick Steves’ Facebook blog). In the Anfoushi district of Alexandria, an engagement party had spilled out onto the streets. There was live music, and all the guests were dancing. When some from the party noticed us watching, they invited us to join. Grateful to be welcomed, we joined the festivities. Despite not knowing the dances or anyone at the party, we became a part of this local scene–a celebration of love, of happiness, and of a future filled with both. 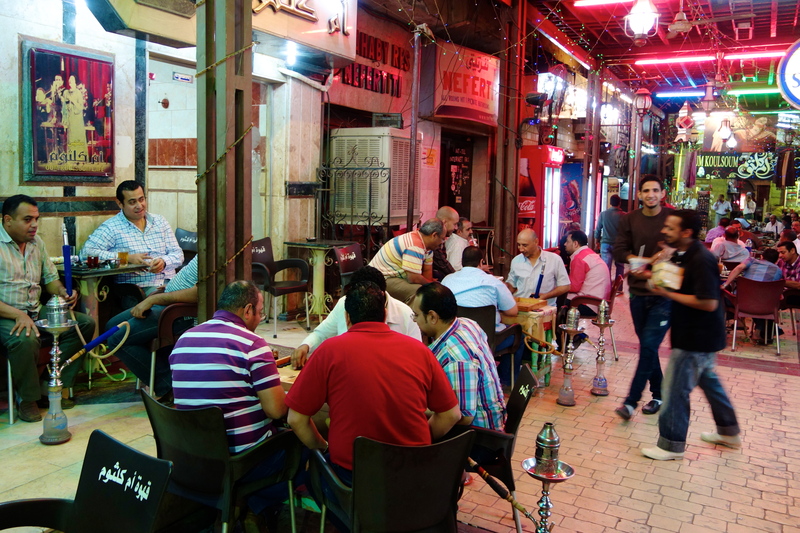 Egyptian gentlemen gather, as they so often do, for a game of backgammon or dominoes, social time, and hookah smoke. Later on we joined a group of proud old-timers who were playing dominoes and backgammon, and relishing their hookahs alongside a cup of mint tea. Normally, local women do not socialize in such places, but as a visitor (and among the fellowship of local friends and Rick), I joined in on the fun. While these men had elaborate pipes for smoking strong tobacco, we got the pipes with plastic tubing–probably meant for the casual smokers and non-regulars who preferred the sweet, apple-infused tobacco. I kept up with my friend Hammad for a while, matching him drag for drag. But not too long after, I was feeling my mind want to separate from my body and my dinner wanting to separate from my stomach. As our discussions turned to health, I asked Hammad about what Egyptians do to stay fit. He explained that there aren’t parks where you can go for a run or fitness clubs like Gold’s Gym, so families join social clubs. There they engage with neighbors and friends while playing tennis, learning fencing, running around the track, swimming some laps, watching a movie, or meeting for dinner. Families have been members for generations, and nowadays, since it costs about $20,000 to become a new member, people feel very lucky when they marry into a family that belongs to one of these clubs. Clearly, this is not for your average Egyptian, but it is interesting to see this slice of life–one that most Americans never hear about. Egyptian civilization has been around for 5000 years. And while learning its history and heritage is mesmerizing, discovering what life is like in present-day Egypt is equally rich and rewarding. I have really enjoyed following your blog. Your photographs are beautiful. Egypt is a place I have always wanted to visit and your style of writing makes us feel as if we are right there too. Great memories Trish. And I didn’t know you were keeping track of all the wonderfully vivid and intimate insights. Beautiful writing. WHOA! THANK YOU!! Invaluable travel tip to bring the tissue packets because non-residential bathrooms lack toilet paper! 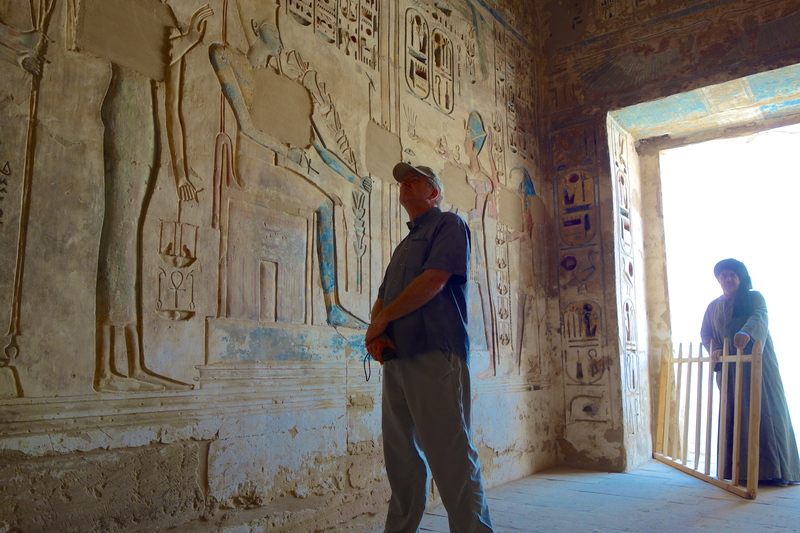 I am arriving in Egypt on June 22 for 2 weeks: Cairo, Luxor, Nile Cruise, Aswan, Abu Simble. I have been going back and forth as to if this is a sane idea to go now. Do I go or do I submit to the fear? Your blog certainly reassured me of my thoughts that this is the right time to visit Egypt. It’s always prudent to be cautious and aware of your surroundings and the climate (political) of the places you visit. But it’s equally important to know the difference between caution and fear. I hope you have a great time in Egypt. btw – aren’t pictures forbidden in the Valley of the Kings? not to mention that your picture is IN a tomb in the Valley of the Kings? See the man standing by the entry? He gave us the OK–no flash, facing the exit. Great – thank you…I thought I read online that cameras are not even allowed into the Valley of the Kings at all AND there are metal detectors to find them on you if you try to hide them as you enter?